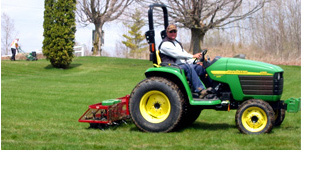 Our lawn care division has been working with pesticide free products long before the Ontario Pesticide Band was passed. We are committed to researching and developing alternative methods that will benefit your lawn from the soil up. Our lawn care programs are customized to your lawn’s specific needs which will help you to get the thick luscious lawn you’ve always wanted and the type of lawn your neighbour’s only dream of having. All pricing is based on the square footage of your property, request a quote and we will have a technician out within 24 to 72 hours.